Venezuela Solidarity Campaign’s AGM met on 13th October to review its work and plan how to combat the growing threat posed by the United States to the country’s national sovereignty and the achievements of the Bolivarian Revolution. The political context for the campaign’s work has been dominated by the issue of relations with the US and by ongoing attempts by anti-democratic elements of the right-wing opposition to overthrow the elected government. US actions to undermine and delegitimise Venezuela’s constitutional government have been stepped up, by both an increasing range of sanctions and an intensification of negative media coverage. Sanctions – a key part of the economic war being waged against Venezuela – have cost the country $6bn since Aug 2017, equivalent to 6% of its GDP. At the same time, the right wing in Venezuela has continued its efforts to bring down the elected Maduro government, with some sections of the right-wing opposition boycotting the Presidential election, and also withdrawing from a dialogue process. The goal for both the US and the right wing is of course ‘regime change’. Trump has not ruled out military intervention and other leading Republicans have even invoked the possibility of a right-wing military coup in Venezuela. Despite increased scrutiny and misrepresentation of its work by some of the British media, the AGM noted that VSC’s campaigning had in the last year managed to consolidate gains already made, mobilise its existing supporters successfully and attract some additional support, particularly by getting more trade union branches to affiliate. A large part of VSC’s work focused on publicising and explain the right wing resurgence in Venezuela and Latin America as a whole and Trump’s regime change agenda – culminating in the mobilisation for demonstrations against Trump, including the massive march in London on July 13 against his visit. Other events included a successful VSC dayschool to hear report-backs from observers at the Presidential election and an emergency rally in March. VSC also played a prominent role in the organising of the annual Latin American conference, with three sessions devoted to Venezuela. Underpinning this work has been a drive to explain what’s really happening in Venezuela through briefings, extensive social media work, meetings around the country, including fringe events at Labour Party and trade union conferences, and media appearances by VSC’s General Secretary, Dr Francisco Dominguez. VSC has also supported a range of other events and initiatives aimed at highlighting key regional issues, such as Britain’s spyware sales to the Honduran regime and Lula’s imprisonment, and promoting Latin American solidarity. Our work in supporting the ‘No Coup in Brazil’ initiative to put that on the agenda here has been particularly important. The AGM agreed three motions to direct its strategy and activities in the coming year. The first focused on the need to continue to defend Venezuela’s sovereignty and to oppose Trump’s sanctions against Venezuela and his ‘regime change’ agenda. In doing so, VSC will continue to raise awareness of why any attempt to use violence in or against Venezuela to overturn constitutional mandates, including that of the democratically re-elected president, must be opposed. Part of this will involve continuing to campaign for the British government to support dialogue in Venezuela and not back US-led attempts at regime change. The AGM also agreed with the supportive amendment from Kate Hudson, General Secretary of the Campaign for Nuclear Disarmament, which stressed the importance of publicising the danger of renewed US militarisation in the region, and building on VSC‟s good work with the anti-war and peace movements against the threat of US military intervention. The second motion noted Venezuela’s achievements in building two million houses through its Great Housing Mission programme, launched by Hugo Chávez in 2011. By the end of 2019 another million homes should have been built, with five million houses the ultimate target. Other achievements celebrated included a variety of advances in LGBT rights. The Maduro-led government is committed to following its 2013-2019 socialist plan, which specifically emphasises “strategies for resistance and liberation” for “sexually diverse (gay, lesbian, bisexual and transgender) groups, who are living in conditions of repression and humiliation”. To widen knowledge of these and other achievements, VSC committed to updating its pamphlet on social achievements in Venezuela since 1998, to offer speakers and produce materials to publicise the advances in LGBT rights, and to publish a special briefing highlighting Venezuela’s successful housing drive. The third motion focused on the need to campaign against US interference in Latin America, noting for example its ‘regime change’ agenda for Nicaragua, as well as its historic opposition to the Cuban Revolution. 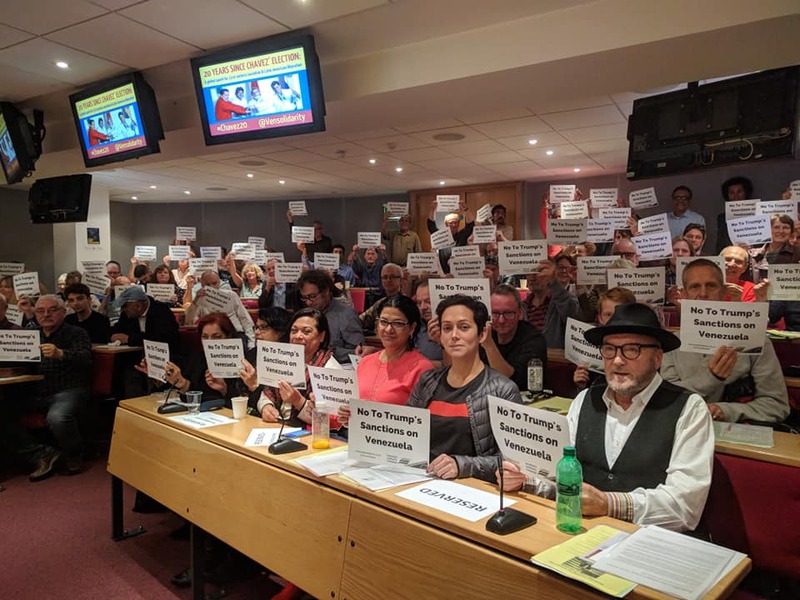 This will involve VSC continuing to work closely with the Cuba Solidarity Campaign and Nicaragua Solidarity Campaign, including through labour movement fringe meetings and the annual Latin America conference, and support the ‘No Coup in Brazil’ initiative. Attacks on the Evo Morales government by Republican Ileana Ros-Lehtinen in summer 2018 seemed to include Bolivia in its ‘regime change’ agenda and should therefore be opposed. The AGM therefore also agreed to seek to work with other Latin American solidarity and labour movement organisations to raise awareness of Bolivia’s achievements and highlight the need to oppose external intervention. To this end, VSC will organise a special event looking at the history of the US war on democracy in Latin America, as outlined in VSC’s recently republished pamphlet by Richard Gott. In an open afternoon session (chaired by VSC’s Vice Chair, Doug Nicholls) entitled ‘20 years since Chávez’s election: a global spark for 21st century socialism & Latin American liberation’, the Ambassadors to Britain from Venezuela, Cuba and Nicaragua gave their thoughts on Chávez, his achievements and the legacy of his dedication to advance the causes of socialism and Latin American liberation. Rocio Maneiro, the Venezuelan Ambassador, reflected on how, when Chávez appointed her to diplomatic positions, his conversations with her were focused on how Venezuela could benefit the country to which she was being posted, and how the cause of Latin American – and Caribbean – unity could be advanced. The Cuban Ambassador Teresita Vicente recounted how Fidel Castro had recognised this commitment in Chávez, and how this was coupled with a seemingly inexhaustible energy and drive. In a moving moment, she read a birthday letter from Fidel to Chávez. Noting “the (not to be underestimated) alliance of Americans and oligarchs in Venezuela”, Fidel affirmed that “special credit is due to the Venezuelan people for their immense capacity for comprehending the challenge they and you are facing together.” Tragically, Chávez died the following year. Guisell Morales-Echaverry, the Nicaraguan ambassador, spoke about how Chavez’ achievements inspired a resurgence of progressive movements in Nicaragua which led to the return of a Sandinista government with major advances in social progress and democratic inclusion. The ambassadors were joined by Ken Livingstone, former Mayor of London who hosted a visit by Chávez to London in 2006. Visiting Venezuela later the following year, he and Chávez announced an agreement exchanging Venezuelan oil, enabling TfL to subsidise fares for a quarter of a million poor Londoners, in return for City Hall expertise in urban management. This, said Ken, epitomised what Chávez stood for, a commitment to improve the lives of ordinary people and show that another world is possible. A final contribution came from George Galloway, a longstanding supporter of Latin American solidarity movements. He defended Hugo Chávez, and Nicolas Maduro, against the numerous attacks made by the mainstream media on the Bolivarian Revolution, which we greatly appreciate.